Remember the UK General Election? Yes, we know it’s a distant memory now, and you’ve probably forgotten YourNextMP, too. But the project is far from dormant! 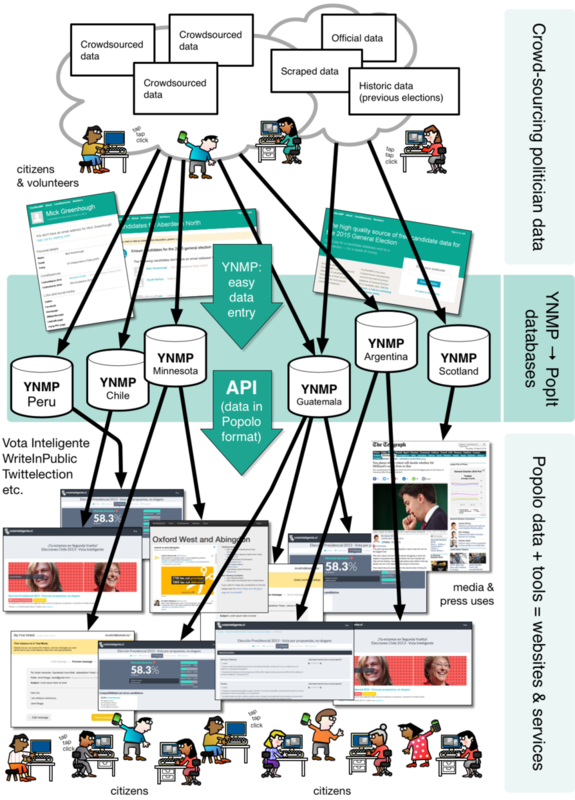 YourNextMP successfully crowd-sourced information on every election candidate, and made it available as open data for anyone who wanted to use it to build useful websites and online tools. And while here in the UK we won’t have further use for it until 2020, the great news is that the underlying code can be repurposed to work for other elections around the world. Thanks to Yo Quiero Saber, the first of these is now live and collecting data for Argentina at http://investigacion.yoquierosaber.org/, and there are also plans for DataMade Chicago to use it in the USA. We just launched Yo Quiero Saber and it’s had a great reception. You’re welcome to visit our main site, where we feature the game and full profiles for candidates for presidency and governors of four provinces. You can also see our YourNextRepresentative instance (we renamed it, since MP is not a relevant term for us) where, in just two weeks, we’ve already had more than 100 registered users, and have also managed to add all the official candidates from DINE (the national elections office). We’re still missing city-level and provincial-level candidates from the site, but that’s going to be improved before the October general elections. So far, we’ve had 350,000 unique users and a million page views since launch. That means we are close to reaching 1% of the total number of voters in the country. Neatly, the number of people who have used the site is roughly equivalent to the number of voters a party needs to pass from this election to the next ones. Media reception has been great with online portals big, small and regional mentioning our site and some of them embedding our game in their articles. We’ve also been kept busy with radio interviews and some tv programmes featuring the game. In Argentina, the media is deeply split down party lines, and we very much like the fact that we’ve surfed that divide, being featured in media from both sides of the political spectrum. This is just the beginning: we’re working as an alliance of local NGOs, and our bid for a prototype grant from the Knight Foundation has been successful, meaning that we can forge ahead with our plans. We’ve also had support from HacksLabs, a data journalism accelerator. The full list of partners can be found on the footer of both sites. We’re really glad to hear of this success—it’s great to see the code get another lease of life, which is, of course, what the Poplus project is all about. Naturally, the YourNextRepresentative codebase also available to other countries who want to help inform their electorates, and what’s more, Martín says they’ll be glad to offer help to anyone who wants it. That goes for us here at mySociety too. Congratulations to CEHUM in Chile, who have just announced the launch of La Constitución De Todos (Constitution For All). La Constitución De Todos allows citizens to discuss, vote on and propose changes to each article of the constitution online, using code that originates from Morocco’s Legislation Lab from GovRight. The launch comes in the context of the new Chilean president announcing that there will be a widespread public consultation on a constitution for the nation. The two organisations might never have met, if it hadn’t been for the Poplus kick-off conference back in 2014, where the idea was first mooted, and GovRight stepped in to offer help. The Poplus federation was founded on the idea that sharing civic code and knowledge can benefit organisations worldwide: this project is another superb example of exactly that. The Knight Foundation’s News Challenge offers funding to innovative projects. We wonder whether they’ve ever had a bid whose collaborators span six different countries before. Well, now they have: the plan to extend YourNextMP to work in Guatemala, Chile, Argentina, Peru, Scotland, and Minnesota is a great example of the Poplus federation in action. You can read more about the plans on the bid page—and please click the little pink heart to give us ‘applause’! 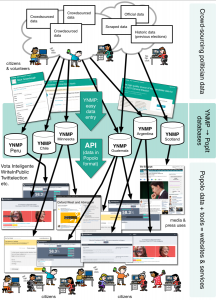 In short, we want to build on the success that the YourNextMP crowdsourcing platform has had here in the UK. Right now, YourNextMP offers open data on every candidate for the UK general election. That data is being used by major media companies and internet giants, and underlies several innovative online tools. On top of that, it’s getting thousands of visits every day from people who simply want more information about who’s standing in their area. With some modification, other countries could use the same tech in advance of their own elections, giving their citizens the same opportunities to become more informed about those standing, and to develop still more useful online tools. Because Poplus is an international federation of organisations with similar needs, we can come together to forge plans that will benefit all of us, and then work together to make them a reality. Our plans wouldn’t just benefit those six countries, either. Like every bit of Poplus tech, it’d be available as open source software for anyone to use, anywhere in the world. And that’s what Poplus is all about: maximum impact from every bit of code.